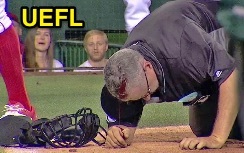 Umpire Paul Emmel was hurt badly by a flying whole bat in Anaheim, forcing the interim crew chief to leave Thursday's Athletics-Angels game with two outs in the bottom of the 9th inning. Emmel bleeds after a bat strikes his head. With just one out remaining in the contest, Angels batter Jefry Marte swung and missed at a first-pitch fastball from A's pitcher Sean Doolittle, losing his grip on the bat, which flew directly back to and struck Emmel on the top of his head, producing a deep gash and steady bleeding from the anterior scalp, which was beyond the coverage of Emmel's traditional-style facemask. Emmel was replaced by 3B Umpire Quinn Wolcott, leaving acting crew chief Mark Carlson (1B) and Mike DiMuro (2B => 3B) to work the bases. Marte flew out to end the game nary one pitch after Wolcott took over behind home plate. According to MLB and Angels reports, Emmel is doing well, having been transported to a local hospital to get stitches.